Fans of mirrorless cameras will now be confused with the presence of the Olympus OM-D EM-10 and Fujifilm X-T1. 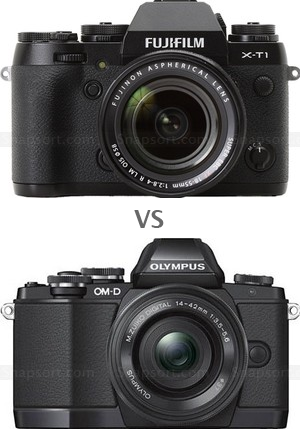 Both are cool mirrorless cameras. Fuji X-T1 comes with a design that is different from the previous X series, is now more like a series of belonging to the Olympus OM-D with the 'bulge' at the top, as a place for the viewfinder. In addition to the X-T1 filled old school camera style controls need to be rotated to a certain number, such as ISO, shutter and exposure compensation. Olympus OM-D EM10 is the most affordable camera of the OM-D series, and the price can compete directly with the Olympus Pen. Although Fujifilm X-T1, and Olympus EM10 cannot pitted head-to-head directly, but both are equally attractive for reviews. Analysts photography many say that Fuji arguably successful mix strategy, which is oriented to the genuine need of photographers, such as the quality of the X-Trans sensor APS-C sized, high-quality body and lens are also good. 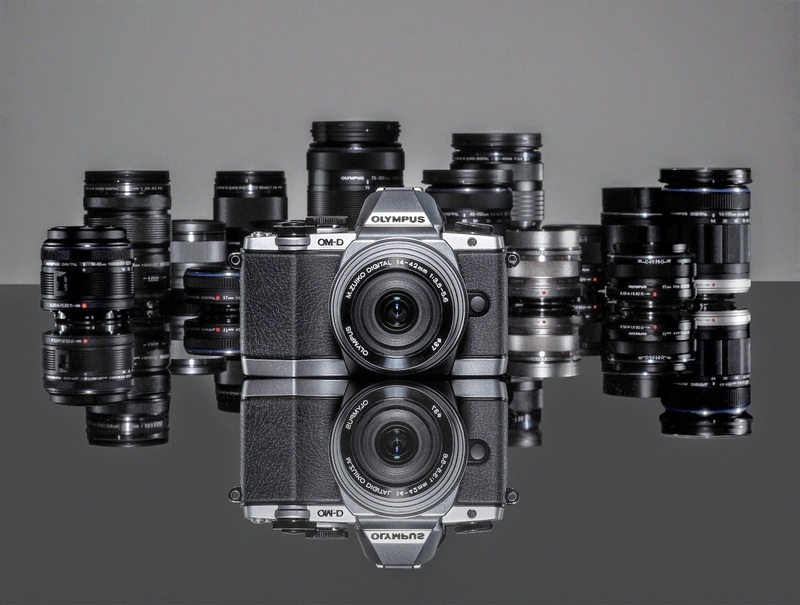 Fuji mirrorless line-up is quite complete, from the X-Pro1, X-E1, X-E2, X-A1, and X-M1, but Fujifilm has released the X-T1 to add variety to your choice. Fujifilm X-T1 design is somewhat different, more retro or classic memorable, and the price is quite high, but if you are not a problem with the budget, then the X-T1 is appropriate to accompany you anywhere, even very suited for business trips and vacations to Bali. 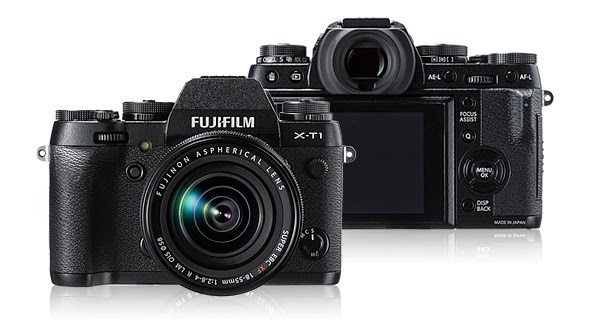 The design of Fujifilm XT-1 is quite impressive from the outside shape, its specification similar to the XE-2, but the design of the XT-1 is different. This camera is perfect for photographers who are happy using a fixed lens, which is not too long and not too big. The camera is resistant to water splashes and dust, and can survive in the extreme conditions of up to -25° Celsius. In addition, flexibility is the screen size 3-inch has also been coated with a layer of glass that is useful as a protector. Unlike the Fujifilm XT-1, then the appeal of the OM-D series are located on the packaging of retro design and technological sophistication of the sensor will be retained in the Olympus OM-D E-M10, in order to cut the price, the size of the OM-D E-M10 minimized, and the body was not equipped with weather resistance features, but you will still get sharp pictures and brilliant color detail. If you choose the Olympus OM-D E-M10, then you will enjoy the electronic vewfinder with 1,440,000 pixel density point, and is equipped with technology that combines the sophistication of the OM-D E-M5 and OM-D E-M1. 16-megapixel Live MOS sensor in this camera is exactly the same with the OM-D E-M5. While the processor is adopted from the sensor OM-D E-M1 with the Olympus TruePic VII sensor, so you will get an impressive performance. OM-D E-M10 has also been equipped with Image Stabilization feature. If the OM-D E-M1 and M5 brings the E-5-Axis Image Stabilization, OM-D E-M10 comes with a 3-Axis Image Stabilization which claimed still capable to prevent the risk of blur when taking pictures or recording video. Just like Fujifilm XT-1, then the Olympus OM-D E-M10 also has a Wi-Fi connection to connect to other devices such as smartphones or tablet PCs, and some creative options such as choice of filter effects options, as well as a flexible touch screen measuring 3 inches which can be used to explore the shooting. If you have got extra budget, and your product lovers with a classic design, the XT-1 and Olympus OM-D E-M10 is the right choice. All you have to do is to hold both cameras in your favorite camera store, so you can feel the difference. Hopefully you can find your style with proper, so you will have a new camera soon.